After a few hours of work, I am proud to announce Hodge Podge has a logo! It’s by no means ground breaking, but I think it looks good and represents how I see Hodge Podge Games and the projects I work on. I thought I would share my process of designing it, in case it helps anyone! a mutton or vegetable soup without much of a recipe – essentially a soup made with whatever you have at hand in a big pot! So I roughly knew what I wanted for a logo: a rustic crock pot filled with mush. I’ve played Don’t Starve a lot, so something resembling the Crock Pot sounded like a good match. Without spending much time researching logo ideas, I went straight ahead and drew the quick outline of a pot in Inkscape (a great tool for vector graphics.) The second step was then to draw the overlay. For colouring, I exported the overlay to Gimp. I have a bamboo graphic tablet which makes it pretty easy to colour things – you just select the area you want to colour in (from the overlay) and go crazy with colours, shadows and highlights. Although I thought the colours & pot looked fine, I wasn’t sure it worked well as a logo. I had an idea of throwing pixels / pixel art in the pot (assets from my current project), but somehow this also didn’t feel right. As a last desperate attempt, I tried to convert the above to low-res pixel art, hoping this would somehow look better. Oh boy was I wrong – the pixelated pot worked even less. I tried various colour combinations, including a black background… But nothing felt right! Calling it a night, I went to bed defeated. My second approach in the morning was to find some ideas for the design. One of the big issues of my previous attempts was the clarity of the logo. So, I decided to use Inkscape, and plain colours only for more visibility. Internet research also gave me some ideas about how to put a pot and the Hodge Podge name together. I mentioned Don’t Starve earlier on, and a lot of the cartoon/grim style it uses in its graphics, goes with the type of projects I want to produce. For example, in the game I really like the look of the old fashioned banners they use and how they make their text very easy to read. This link shows an example of such banner. 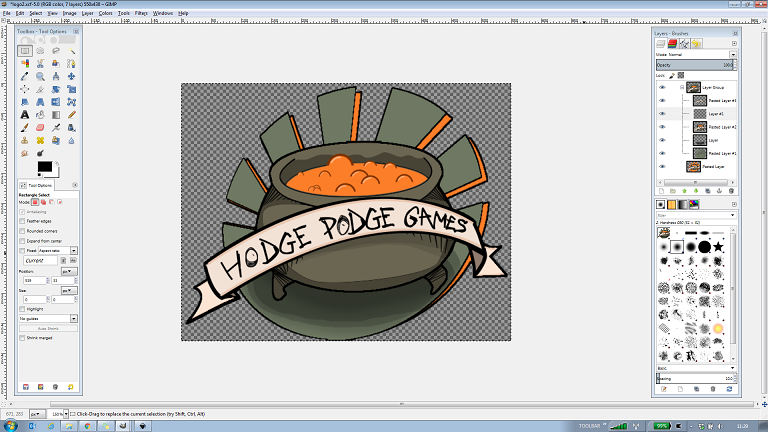 So, I decided to draw a banner with the Hodge Podge name, and combine this with the pot I created the day before in Inkscape. This time, I kept the colours simple and created the whole design in Inkscape. I also used black lines to reinforce shadows and simplified the mush in the pot. To make the pot stand out, I added a circle behind it. I thought this added colour and made the logo look more dynamic. With all this done, I was pretty happy with the general look and feel. Although Inkscape is great to produce neat images, I am more familiar with Gimp when it comes to shading & quickly changing colours (hue etc). So, I copied the work I had done so far into Gimp and started playing with the various layers & colours. I toned down the circle on the suggestion of my wife (full orange was a bit too much) and added a couple of shadows to reinforce the banner & pot. Previous Post: My Indie Dev Kit!